Over the past few years we’ve learned to grow and preserve our food, bringing us much closer to self sufficiency. What’s more is that we are able to produce an abundance of great food on our farmstead that we are able to offer to your family. We don't want to produce vegetables at any cost. We take into consideration, the total cost. We always grow with the health of the environment in mind. We believe strongly in the principles of Permaculture and the practices of Regenerative agriculture. Agricultural practices have a huge impact on the environment. Minimizing damage is not enough. We want to make sure that we leave our little piece of the planet in a better condition than we found it. We are more than just a farm, we believe that in order to make this world better, we all need to work with other people in our communities. Our vision of Ferme La Machine has always been to collaborate with other producers who are doing it right. We actively seek out other ethical producers to offer you the best products from our region, making it easier for you to buy most of your groceries directly from farms, encouraging producers who are doing it right. Our philosophy of growing better, not bigger. Being a small family farm allows us to care for the plants and animals without the compromises that often come with large scale, even organic production. What does this mean? Producing large quantities of the same vegetables, even in rotation can start to resemble mono-cropping and can result in similar problems to those in larger scale agriculture making it harder to mitigate pest problems without having to resort the use of pesticides that can have negative impacts on our environment. If you had a garden at home, you wouldn’t use pesticides, right? Probably because you don’t think it’s right, but also because you probably wouldn’t need to.The small quantity of mixed veggies planted closely together probably wouldn’t attract enough “bad” insects to cause a problem. We grow our fruit and vegetables like it was our home garden, because it is! Join our CSA and it becomes your garden too! Diversity - Natural ecosystems have a huge variety of plants, animals and much smaller organisms. The more players available in the ecosystem, the better nature is able to make its own balance. We favour creating an environment with our gardens that allows this to happen. This is how we measure the success of our farm. Small isn’t about the size of the farm it’s about how you farm - Small, diversified farms like ours can actually produce more per acre than large agricultural operations. We use intensive spacing between vegetables, interplanting, tunnels, integrate animals in the farm and many other strategies to keep a natural balance that maximizes the efficiency and productivity of the farm. This is a continual learning process that we love. 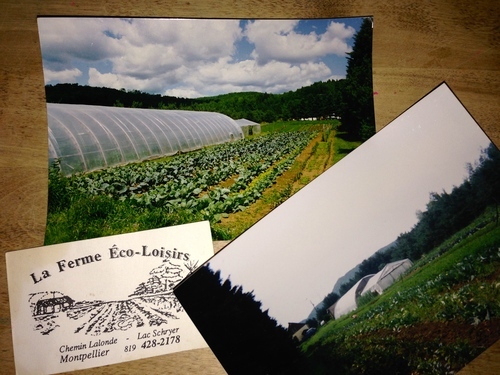 We invite questions about our farm, how we raise animals and grow plants. We believe firmly that questioning your farmer(s) is the best way to truly understand not just where your food comes from, but how it was grown. My next challenge is…using the medicinal plants growing on our land. I’m currently taking a class on how to heal your loved ones naturally. I can’t wait to turn so-called ‘weeds’ into healthy and natural body products. How do I avoid supporting a food system I oppose? How do we find the food that we want to eat, feel good about, and enjoy? The answer, for me, was simple. If you want something done right…. This region has no Big AGriculture to speak of and very little conventional agriculture, really. This means that, to our knowledge, there are no farms spraying pesticides within many kilometers of our farm. So the bees that are attracted to our plants are safe as well as our crops.